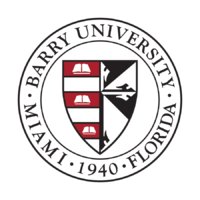 Barry University is a private, Catholic university founded in 1940 by the Adrian Dominican Sisters. Located in Miami Shores, Florida, a suburb north of Downtown Miami, it is one of the largest Catholic universities in the Southeast and is within the territory of the Archdiocese of Miami. The University offers more than 100 degree programs, from bachelors to doctorate, in a number of areas, including: business, social work, law, nursing, health sciences, education, and liberal arts programs. Consisting of six schools and two colleges, Barry University has more than 7,000 students, a campus of 54 buildings, a branch campus in Tallahassee, a law school in Orlando, and 50,000 alumni. Student to faculty ratio is 12:1. Barry College was founded as a women's college by a pair of siblings: Rev. Patrick Barry, Bishop of St. Augustine, and his sister, Rev. Mother Mary Gerald Barry, OP, then prioress of the Adrian Dominican Sisters. The construction of what was then the Barry College for Women began in 1940, in what had previously been "a tract of tropical vegetation." The empty lot was soon transformed into the main campus in Miami Shores, FL. The original campus consisted of five buildings. Mother Barry served as president from 1940-1961. Barry University's main campus is in Miami Shores, Florida. While the main campus is in Miami Shores, Barry University offers several continuing adult education classes at other locations in Florida. Barry University has a campus in Orlando containing the Dwayne O. Andreas School of Law and a campus in Saint Petersburg that has the second branch of its Physician Assistant Program. Barry University also has a campus on the island of St. Croix, where a third branch of its Physician Assistant Program is located. There are more than 40 buildings at the Miami Shores campus. These contain technology laboratories and indoor and outdoor sporting facilities. Forbes's 2015 Ranking of America's Best Colleges: ranked Barry University 615th on their list of America's Top Colleges. Online Psychology Degrees 2016: ranked Barry University as one of the top schools for graduate programs in sport psychology. The Sport, Exercise, and Performance Psychology program at Barry is ranked No. 20, and is one of only two programs from Florida to be included in the ranking. Best-Catholic-Colleges.com 2016: ranked Barry University's School of Social Work as No. 3 in its list of Best 25 Catholic Social Work Schools in the country. TopCounselingSchools.org 2016: ranked among the top value master's degrees in counseling in Florida (Adrian Dominican School of Education). Value Colleges 2016: ranked Barry University's online Master of Public Administration program among the Top 50 Best Value Online. The program, which is offered through the School of Professional And Career Education, is ranked No. 44. When compared to other private and nonprofit schools, Barry ranks No. 14. Barry University became a member of the Sunshine State Conference (SSC) in June 1988 and a member of NCAA Division II since 1984. The Buccaneers have won 16 NCAA Division II national championships (women's soccer 1989, 1992, 1993; volleyball 1995, 2001, 2004; men's golf 2007, 2013, 2014; men's tennis 2010, 2013, 2015; women's tennis 2011, 2014 and rowing 2015, 2016) and 65 SSC titles. The Bucs have produced 309 All-Americans and 361 Scholar All-Americans. "The SSC sponsors championships in 14 sports for men and women: baseball, men's and women's basketball, men's and women's cross country, men's and women's golf, rowing, men's and women's soccer, softball, men's and women's tennis, and women's volleyball." Barry University has more than 60 student organizations, 2 fraternities and one sorority, honor societies, and a student government. Barry has a Department of Campus Ministry. The sacraments of the Catholic Church are administered in accordance with the guidelines of the Roman Catholic Archdiocese of Miami. Protestant and Catholic campus ministers are employed by the University. Protestant Communion is offered monthly in "Multi-Faith Services". ^ As of June 30, 2014. "U.S. and Canadian Institutions Listed by Fiscal Year 2009 Endowment Market Value and Percentage Change in Endowment Market Value from FY 2008 to FY 2009" (PDF). 2009 NACUBO-Commonfund Study of Endowments. National Association of College and University Business Officers. Archived from the original (PDF) on 2017-12-14. Retrieved February 11, 2010. ^ "ACCU Member Institutions" (PDF). Archived from the original (PDF) on 27 March 2014. Retrieved 18 June 2017. ^ a b c d e "History and Legacy". Barry University. Retrieved 2017-05-10. ^ "About Barry : Barry University, Miami Shores, Florida". www.barry.edu. Retrieved 18 June 2017. ^ a b Ground is broken for Florida's first Catholic college. Florida Catholic. January 2–15, 2009. ^ a b "Barry University Quick Facts". ^ Russett, Cynthia; Schier, Tracy, eds. (2003). Catholic Women's Colleges in America. JHU Press. p. 236. ISBN 9780801877667. ^ a b c "Chapel". ^ "Dwayne O. Andreas School of Law : Barry University". www.barry.edu. Retrieved 2017-09-20. ^ a b "Library Services". ^ "About Us: Law School Mission Statement", Dwayne O. Andreas School of Law, Barry University. ^ "Page Not Found". barry.edu. Retrieved 18 June 2017. ^ "ADSOE Programs Selected to Join Carnegie Project on Education Doctorate". Barry University. April 27, 2017. Retrieved 2017-05-10. ^ "Student Organizations Directory (A to Z)", Center for Student Involvement, Barry University. ^ a b WBRY, Barry University Radio. ^ a b "Campus Ministry". Barry University. Retrieved 2017-05-10. ^ Wakefield, Rebecca (May 17, 2016). "Oscar-Winning Screenwriter Alex Dinelaris Returns to Barry". Barry University Magazine. Retrieved July 27, 2017. ^ "Distinguished Alumni Award Recipient". Barry University Alumni Relations. 2013. Retrieved December 18, 2016. ^ "Distinguished Alumni Award Recipients". Retrieved January 11, 2015. ^ Jones, Carolyn (2000-06-14). "The Glory Years / S.F. Fillmore District of the '40s and '50s revisited in photo exhibition". SFGate. ^ Rodriguez, Juan C. (June 8, 2013). "Miami Marlins pick Barry University and Nova High School product Tyler Kinley in 16th round". South Florida Sun Sentinel. Retrieved March 24, 2018. ^ Curry, Colleen (May 2, 2012). "Shaquille O'Neal Receives Doctorate Degree". ABC News. Retrieved May 7, 2012. ^ Rodriguex-Soto, Ana (Fall 2011). "Barry Doctoral Candidate Named Chicago Bishop" (PDF). Veritas. Retrieved July 27, 2017. ^ "Events : Alumni Relations : Barry University, Miami Shores, Florida". www.barry.edu. Retrieved 18 June 2017. ^ "Saima Wazed Putul gets Distinguished Alumni award from Barry University". bdnews24.com. Retrieved 11 February 2016.